Bharat Sanchar Nigam Limited (BSNL) has today announced a revision to its General Prepaid plan in all telecom circles. With the revision, BSNL has increased the price of the STV of general plan to Rs. 180 from the previous price of Rs. 39 and it’ll go on to carry a validity of 180 days. With the increase in the price of the STV, BSNL has also increased the amount of freebies it is offering now. 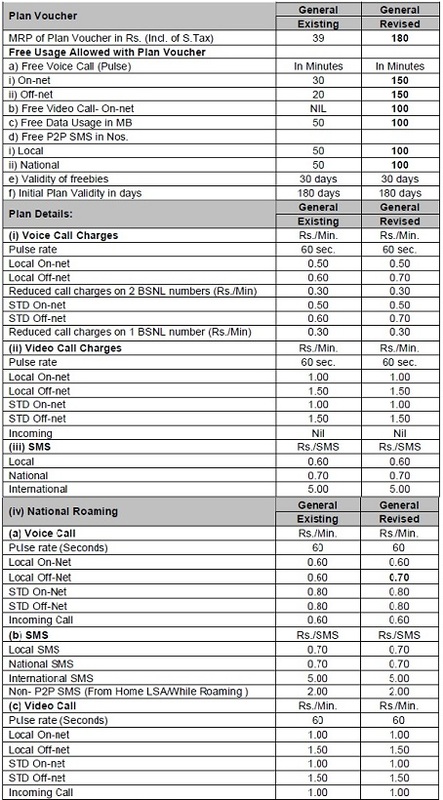 BSNL is now offering free 150 minutes of Local on-net and off-net calls each. In addition to it, BSNL will also allow users to make 150 minutes of On-net Video calls and provide 100 MB of data usage. There is also 100 Local and 100 National SMS free included in the freebies. All of these will be valid for 30 days from the activation of the STV. Reduced call charges on 2 Local BSNL numbers at 30p/min. Reduced call charges on 1 STD BSNL numbers at 30p/min. Incoming Video Calls: Re. 1/minute. For more on the new STV, refer the Plan details below. These changes will come into effect from 01-05-2012.